Bold names are new additions in 2008. Also in the April issue, Fortune Magazine announced the number of firms in the two top tiers by state: the Fortune 500 firms and the Fortune 501 to 1,000 firms. The top 3 states in terms of all F1000 rankings are: Texas, California, and New York. Just like last year, Texas was home to the most number of firms in both categories: 58 F500 firms and 55 F501-1000 firms, for a total of 113 firms on the Fortune 1000 list. California was second with 52 F500 firms and 51 F501-1000 firms, losing 1 firm from the second tier, with a total of 103 firms on the Fortune 1000 list. New York was third with 55 top tier (loss of 2), and 38 second tier firms (an increase of 1), or a total of 93 firms on the Fortune 1000 list. 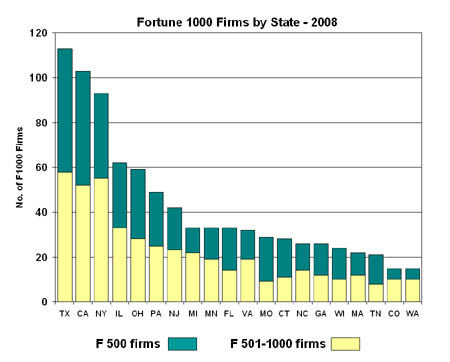 It should be noted that Texas, since 2001, has added the most number of firms to the Fortune 1000 list: a total of 26 Texas-based firms. The only states that came anywhere close to this were New Jersey and Virginia, which added 6 each over the same period.